John Hinderaker at Powerline has a good piece lambasting those scurrilous people who maintain that if you support the Tea Party movement, you are a racist. He mentions that there is the same amount of evidence that TPers are racists as there is that those who make the baseless charge are themselves child molesters. If you think about it, those who allege racism are homo sapiens, just like child molesters. And they are also likely to deny that they are child molesters, just like real child molesters do. Why the more I think about it, there are unlimited similarities between those who make false charges and child molesters. How dare these child molesters impugn the good and decent folks of the Tea Party. In a way, Democrats had to pass it, even knowing that it greatly endangered their House (and for all we know, Senate) majorities; if they looked at their own proposal and concluded it more harm than good, why on earth would the country need them? Although many promises had been made that there would be a jump in approval ratings after the bill was enacted, because the people would finally get to see what was in it, just the opposite has happened. Whether there are just general misrepresentations of its benefits, or the fact that Congress cut itself off of all healthcare in their deliberate and careful approach to writing the bill, people are not happy. And that's without even answering the question of its Constitutionality. But what if this is all there is? Do the Democrats honestly believe that the public are going to reward them with accolades? If so, I want some of those drugs that the so-called "reality people" are taking. And we still have three more years before the benefits kick in. One should always try to think of the question not asked, and then ask why it wasn't. The question in this article is one of those. Why are there no glaciers in the Bob Marshall and Missions, nor are there proportional glaciers north of Glacier Park? If the glaciers in the Park are the last remnant of the last Ice Age, isn't it more interesting that any glaciers remain rather than that they are disappearing? Could Someone Please . . .
Show me an example of where people in positions of authority are actually urging violence or sedition by the Tea Party? Not counting lunatics like Joel Klein, Frank Rich, or today on CNN where Gov. Granholm is claiming that certain speech is out of bounds. Can you show me any unambiguous call for violence? Not Palin's urge to "reload" because if that was all it took, I am sure that someone responsible would have objected to calls for Bush's assassination, or Cheney dieing of a heart attack. If on the other hand, this is just a cynical effort to squelch legitimate public discourse, well then, you can just go to hell. Five years ago, it all started with this. What a long strange trip it's been..
Doug Schoen has a piece where he tells the Democrats how they can save their bacon in November. Since the anticipated "bump" from the passage of Health Care Reform (or is it Health Insurance Reform?) never materialized, Democrats have to be standing around wondering what happened. Especially after they felt so confident, they were predicting 40 years of Democrat dominance. So, what actually did happen? I will propose a few suggestions, confident that Democrats will never actually consider them, since they seem to lack the intellectual ability to examine an issue dispassionately. First, Democrats, especially liberals (read Left, since some people who claim to be liberal are anything but) are really a minority. They are outnumbered two to one by self proclaimed conservatives.The Democrats were also very successful in painting Republicans with a very negative brush, resulting in Conrand Burns losing his seat to Tester as an example. The problem here is that the Democrats are not more honorable or moral than the Republicans. Remember Nancy Pelosi was going to drain the swamp, except of course for Charles Rangel, John Murtha, Morin, and so many others. In fact, the Democrat leadership has done yeoman's work in protecting these people rather than rooting out corruption. Next, in 2008 the Democrats ran on the platform that they weren't Bush, just like in 1976, when they ran as not being Nixon. You can run against someone only so far, As it is now, the electorate is about evenly split between Obama and Bush as to who they would prefer. Also in 2008, Obama ran on the solid platform of "Hope and Change." It wasn't really his fault, but he did exploit the ambiguity of the mantra because everyone could project just what they thought they wanted onto Obama. The downside is that Obama could never meet their expectations after he was elected. Although the evidence seems to be that he never intended to do anything but to repay his Democrat allies in the auto industry and financial industry. Then, believing their own propaganda, (I am wondering if Bill Clinton isn't deliberately trying to sabotage Obama by declaring an improvement in public opinion after the bills passage) led them to ram through a massive social program that the public was opposed to. Nancy Pelosi claimed that all would be better when the public got to see the bill, but just the opposite happened. A good part of their problem is that to even pretend it's fiscally solvent, they had to defer benefits for three years. And in the process, because they rushed the bill through, in spite of all of these promises, they managed to cut themselves out of any health care until 2013. The irony alone is delicious, but as a metaphor for being too complex, it is without equal. Then, just to top it all off, the Tea Party arose, and the Democrats got it completely wrong. First they claimed it was astro-turf, mostly because they are very familiar with astro-turf counters to anything that Bush did. Since Soros paid for all of their projects, they assumed that there must be someone on the Republican side who was being the yin to Soros' yang. Except there isn't anyone. Next, the Democrats through their state controlled media tried to denigrate the Tea Party by asking where the leaders are, or what is the message. They fail to grasp that this is a completely self organizing group who are angry with the direction of the country. Then, the schtick is that the TPers are just ignorant rubes and hicks. Which was shown to be false by the NYT But still they persist in trying to denigrate and diminish TPers. Some do it by falsely accusing them of racism, a most despicable tactic, because it minimizes actual racists. And once the truth came out that the TPers were actually better educated and older, the new spin is that they are just spoiled elitists. I am sure though, that the Democrats are particularly frustrated by the fact that the usual tactics of social control that they have used these many years are not working. How dare these people publicly disagree with their supposed betters. Except they do. Finally, I would offer this bit of solace to the Democrats - if the Republicans fail to act in a fiscally responsible manner, they won't be in officer for very long either. In honor of Tea Parties across the country, a reminder of our first Libertarians. Of course, they did turn violent and shot at people later. Just wrote the check for $10k to pay for the taxes and the quarterlies, and that hurts. Sure, my wife (The Good Democrat) did a land office business in helping people get on disability, so we reaped the rewards for her hard work. But with the check that was written, I also had to wonder, did our accountant get every tax exemption that we were entitled to? In fact, can any of us who use anything other than the 1040EZ actually be certain that we paid what we were supposed to, and not more or less? And if we did use an accountant, how sure are you that you won't invite an audit? Apparently, Money magazine sent out a sample tax return and asked several different accountants and tax attorneys and none of them did it right. The problem is made worse if you are upper middle class because you don't know for sure that you are in full compliance, while the uber-wealthy can simply make the appropriate contribution to Rep. Charley Rangel and know that their problems are taken care of. The tax code ceased to be an instrument for raising revenue, and is now used as a method of social control. Regulating behavior that we don't like, and encouraging behavior that we want. Of course, like everything that the government does, the actual results never match up against the success of the law of unintended consequences. From a business show: Congress is the only entity that when given an unlimited budget, can still exceed it. For the most part, I find "Birthers" tiresome. Their claim is that Obama is not a legal native born American and without that he is ineligible to serve. While I recognize there is always going to be a question of validity, since the Democrats seem willing to break any rule they can get away with, that doesn't necessarily mean that they are cheating this time. But now, we have a LTC who is claiming that Obama is not his Commander in Chief, and is therefore refusing to follow orders. While I disagree with him, I can appreciate his reasoning. But one thing that I forgot, was that the Obama campaign demanded proof of McCain's birth certificate to show that he was eligible since he was born in the Canal Zone. Would be kind of fun to remind Obama, Goose meet Gander. Government spending is spinning out of control. Yeah, I know, you are probably thinking what else is new. 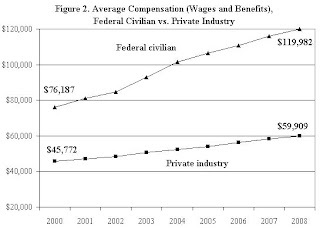 But one of the key problems with government spending is the explosive growth in wages of government employees.An example from the Cato institute shows that federal workers are making more than double the average for the private sector. Montana public sector employees average $60,435 in average total compensation which is still more than the average earned by non-government workers. So how did this imbalance come to pass? 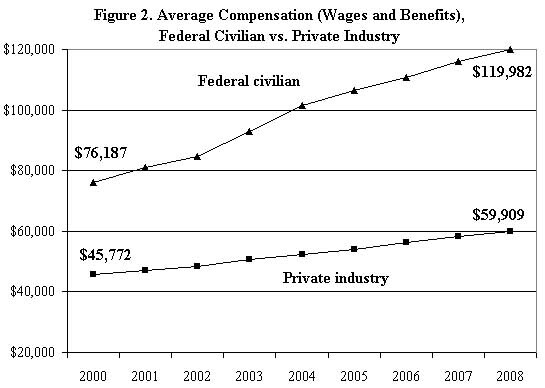 It used to be that government workers were compensated less but had more job stability. Some of the benefits of course were paid health care, but more than anything else, it was a retirement package that is pretty darned good. The unfortunate thing about this is that the accumulation of retirement obligations by the government have to be met by the taxpayer. And it doesn't take long before the obligations get so far out of hand that the rest of the state budget is put in peril. As a state employee, I am going to make a recommendation that appears to be against my own interests but the alternative is having the state go bankrupt, which is an even bigger harm to my interest. But I think we have to do two things. First, freeze government wages until the average government worker is paid the same as the average private sector worker. Second, we are going to have to change the way that the annual adjustment to retirement compensation is made. My proposal is to give 100% of the CPI cost of living the first year, followed by 95% the second, and 90% the second and so on reducing the annual adjustment by 5% per year, The net effect is that after 20 years, there will be no adjustment for inflation, but there will probably be less need as well when the retiree is 80 or older. Putting a pay freeze is not going to be very popular when inflation starts to take off. But the good news is that with inflation, it won't take that long for the state worker wage to come into line with the private sector pay. As a flip side to this, the government would have to make a commitment not to let anyone go, except for job performance problems. Some workers may feel that they could be better served to leave government service and make their way in the private sector. And I salute them. If we do not take steps now, there won't be any retirement for anyone. We have to recognize that state spending is a liability that has to be paid, but the workers have to recognize that killing the goose that laid the golden egg isn't going to work either. As was noted in the Corner of National Review OnLine, and elaborated even further for its falsity at BigGovernment the whole controversy over supposed "racist" Tea Partiers is a complete and utter sham. Throw in the Rev. (ha!) Sharpton claiming to have actually seen video of the use of the N word, and then backtracking when caught in such a lie is even more evidence of their desperation. These outrageous and false accusations are a made up tempest designed to marginalize concerned citizens. It's clear that making an accusation of someone using such a disgusting word, that the burden immediately is shifted to the accused to prove that it didn't happen. And because proving a negative is impossible, the accuser can get away scot free. Well, not anymore. The next question has to be, why do these people stoop to such despicable tactics? In part, it's because they fear those in the Tea Party movement. Not from any actual violence, but because the Tea Partiers are no longer to be herded like the cattle they are considered to be by their accusers. They are standing up to the tyranny of the minority that claims the mantle of moral superiority even though that mantle is undeserved. In fact, not just undeserved, it has been stolen. There is greater similarity between the Tea Partiers and the Civil Rights movement and the reactionaries like Bull Conner and the Al Sharptons in this world than people are willing to admit. The only difference is that Bull Conner wielded the "N" word as a coercive tactic to remind African Americans of their proper place (at the back of the bus, or not at the lunch counter) and Rep. Cleaver who wants to remind the Tea Partiers of their place (shut up and pay your taxes and do as we say). Oh yeah, one other similarity between Bull Conner and those who falsely allege racism on the part of the Tea Party: They're both Democrats. What Are The Limits On Power? Neil Cavuto is interviewing the blogger who got Cong. Hare to admit that he didn't care, and obviously doesn't know about the Constitution. While the Congresscritter's sentiments may be altruistic, they are not based on any understanding of the concept of limited and enumerated powers. 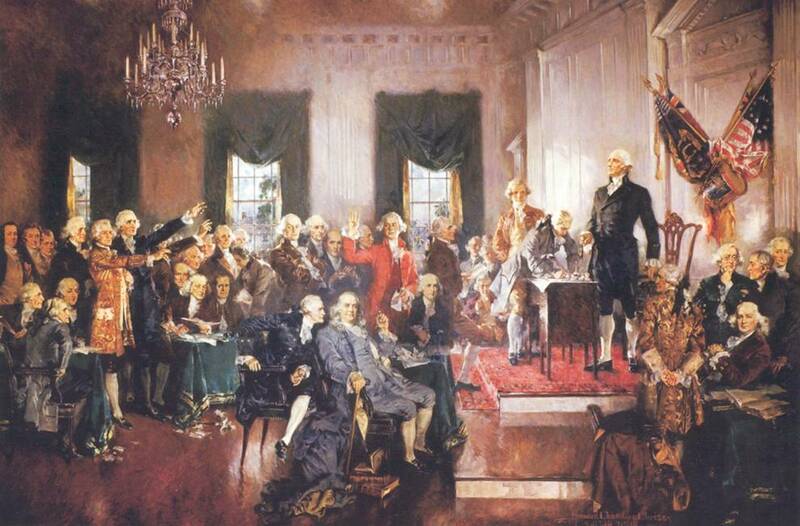 Which begs the question: Under the concept of ObamaCare, what powers are not given to the federal government? Is there nothing that is beyond the pale for them to control, regulate, tax, ban or demand? I ask the question, what the government cannot do, since it seems to be more constrained than asking what the government can do. Where will it end? Can it ever end?